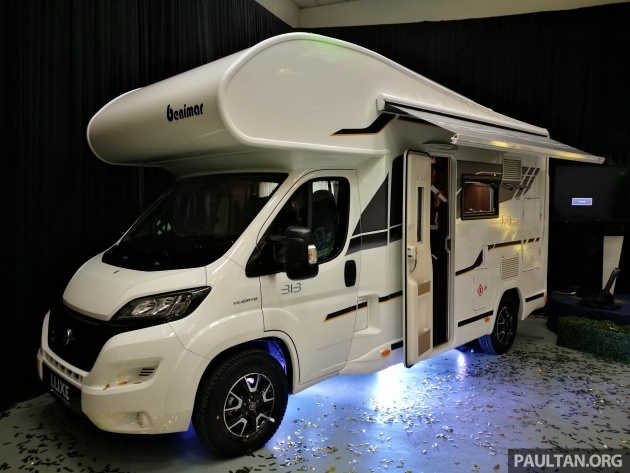 Caravans and motorhomes are a rare sight in Malaysia, though distributor Luxe Motorhomes & Caravans – via WTA Ventures – aims to change that, with the introduction of Benimar Mileo motorhomes. A total of 13 models will be available to the Malaysian market, with prices ranging from an estimated RM609,000 to RM650,000. The Benimar Mileo range of motorhomes are built in Spain on a Fiat Ducato chassis, and all are powered by a 2.3 litre turbodiesel engine producing 150 hp and 380 Nm of torque, sent to a six-speed automated manual transmission. The 13 models on offer comprise eight models from the Mileo 2 Series range and five models from the Mileo 3 Series range – the former being low profile models with berthing (sleeping positions) for two to four, the latter a larger overcab design with berthing for up to six. For all models, the interior floor structure is made of glass reinforced plastic and PVC, which helps attain 99% wood-free construction. All furniture doors feature secure catches, with soft-closing hinges for the overhead curved doors. Air-conditioning comes courtesy of a rooftop unit, along with provision for an LED TV with DVD player and satellite tuner. Also standard is a 150-watt roof-mounted solar panel and a manually-operated Fiamma awning. Starting with the Mileo 201, the base model has seating for four and sleeping berths for two with a fixed rear bed layout. Measuring 2.3 m wide, and 5.95 m long, the Mileo 201 weighs 2,940 kg unladen and is rated for a maximum of 3,500 kg. Payload is rated at 550 kg. The Mileo 286 offers arguably the most social layout, where the seats flank a centrally-located table. As with others in the range, the 286 seats four, with sleeping berths for four. The 286 measures 2.3 m wide and 6.95 m long, with an unladen weight of 3,130 kg. Maximum weight is 3,500 kg, with a 370 kg payload. Rounding up the Mileo 2 Series range is the Mileo 294, a four-seat, four-berth motorhome measuring 2.3 m wide and 7.35 m long. Its unladen weight is 3,240 kg with a 3,500 kg maximum, while payload is 260 kg. The Mileo 294 uses a fixed island bed layout, with the main bed located at the rear of the cabin and another at the front. The model displayed here is the Mileo 313, with six seats and six sleeping berths. The 313 employs a bunk beds layout, where a pair of single beds are stacked double-decker at the back, with a double bed in front, atop the driver and front passenger cabin. The 313 measures 2.3 m wide and 5.95 m long, with an unladen weight of 2,940 kg and a maximum of 3,500 kg. Payload is 520 kg. All Benimar Mileo motorhomes are built to UK specifications, which is what the Malaysian market will receive. So far, Lux Motorhomes & Caravans has received two orders. The Road Transport Department (JPJ) classifies motorhomes as MPVs, and they can therefore be driven by anyone with a D license. Currently WTA Ventures, the company behind Luxe Motorhomes & Caravans, is in talks with various state governments including Pahang and Johor for the creation of caravan park facilities. As of now, there are two caravan parks – one each in Desaru and Pontian, while further north, developments in Gopeng and Cameron Highlands have been verbally agreed upon with the respective authorities. For that price, I could get a real house. Stupid pricing ..
Who’s gonna clean your drop tank? Where to park? What happen when you going for service? Accident how? Where to sleep? I think better check who’s company bring this idea here.My guess is the minister that asked you rent a house instead buying one. Q: Who’s gonna clean your drop tank? A: If you go to the states, austrailia, or NZ, usually the owner is the one should clean it. But if u can solve the owners’ problem, provide a cleaning service for them, i believe u can earn a lot. A: U may park anywhere u want. There are a lot of free parking spaces if you think like an opportunist. Q: What happen when you going for service? A: They will service for you. A: Claim the insurance. U think u pay the insurance every year for what? A: Sleep in the caravan laa… u think people buy caravan for what? drive to work everyday? Stupid answer.We talking about Malaysia.Owner throw their drops where? River? Borrow your house toilet? This is not Aus or NZ or USA which our social environment totally different.Park anywhere you want? Already paid 600k for tiny space then should paying daily parking fee some more? Any space in city is not free.Park somewhere near jungle then no need to work? Buy another car? Accident how and where to sleep? Sleep in caravan when some part of the caravan dismantle? Do you even pay your sewage bill kalio? Do you clean your own sewage? Bro, lu ni copy paste info internet ke? Lu penah bawak Caravann kat Aussie? Kat NZ and Aussie, benda ni dari dulu dah macam culture. Lagi satu certain area di Aussie and NZ memang ada designated area untuk buang waste. Apa you ingat kerajaan/Majlis Perbandaran nak kuar duit nak provide semua benda untuk new culture dari luar? be realistic bro. Parking anywhere? This is funny. Ko selain daripada parking dekat RNR highway kat Malaysia mana lagi nak parking bila self drive? You ingat driving a caravan gives you a privilege to park anywhere without getting ticket? Ikut jalan lama? oklah, parking dekat kedai kopi tepi jalan tengok ladang kelapa sawit? Itu ke view yang you nak tengok? Paling cantik pun view along the east coast itu pun pendek je on the way to Terengganu. In Australia & NZ, benda ni dah study dari awal sebab its their culture. Drive depan sikit ada kawasan pantai, jauh lagi jumpa ala2 desert area macam kat Aussie. You talked based on experience ke? -Some even have designated areas for dumping waste, power charge, parking. Malaysia? You think government/Majlis will fork out money to provide you these facilities for your expensive hobby? Be realistic. Election is coming. More money to use hahaha. -Views. Seriously, majority of our road side ladang kelapa sawit, getah. If you go off highway, a normal kampung road with not much view. Unless you drive to Terengganu – coastal side. Even that not much. Can park anywhere if you think like opportunist? You joking? parking biasa pun kena saman. You copy paste these info or what? Semua techology sama ada software ke hardware, mana satu suit Malaysia mia environment dan culture ni ? Malaysia panas giller, Jacket hoodies semua orang pakai mcm T shirt. Dulu Tandas Bergerak juga popular kat luar negara je, tapi tengok sekarang,become business pula. Kalio tu answer bukan tak realistic juga. siapa yang cukup duit beli ni , mestilah untuk travel atau hangout with friends. Bukanlah tiap tiap hari bawa pergi kerja ke ape. even though parking susah dapat, kena bayar semua tu,u pernah dengar siapa yang ada ferrari tu complain abt parking and tol ke? beautiful and sensible reply… u are a smart guy bro…. Just to add a few.. if u think those will be the new problems to your daily life, don’t buy la…why waste money to buy problems? I hope it can fit in the porch. A ‘Real’ house have 2 pay Quit rent & Assessment. A Car have 2 pay Road-Tax & insurance. Do they pay both? Just asking smith. Am sure some guys may want 2 know. Thank for your contribution 2 this interesting article. From nippon shows, vely popular. For half of that price is ok, but after so many tax and import duty imposed to it, sorry lah. i can but 2 studios in two different places. it is a good buy anyway especially those who have already had a 2mil house…. buy 1 month park laa… mahal ke 1 month park? Thumb up for those who come in thought buying this subsitute as their living home but get shocked by the selling price. Wow.. and I thought moving homes are cheaper than normal ones… these guys are basically loaded. In other words, Fiat *finally* came back to Malaysia (since this RV is based on a Fiat). The Fiat Ducato is like the Toyota Hiace of Italy. Good to see that the distributor has recognised the potential in places like Cameron Highlands for this kind of leisure activity. The weather there is just nice for outdoor camping. They should consider doing a Mileo renting service for tourists especially, if they haven’t already. Or lease it to companies and hotels in Genting Highlands. Anyway, just sharing some suggestions. In other words, Fiat finally has RV! Hahahaha! Recreational Vehicle or Resale Value ?! By the way U Hahahaha, I got the feeling that U are insulting Fiat. Hehehe. Hahaha I see what you did there ! Price looks astronomical. What about US-built motorhomes? Not talking yet about Chinese-made RVs..
With all the loan interest, downpayment and processing fees calculated, a 600k MPV masquerading as house is cheaper than an actual 600k house with shorter tenure and cheaper loan repayments. Housing loans are the biggest money grabbing scam in Malaysia. No, the biggest scam is the whole property market itself. Emm, so the rich guys can fetch some girls and play multiple P inside. Nice. really suit for balik kampung time especially when stranded at highway… can park at emergency lane and sleep. Can it be offer like Airbnb? Bro Semi, did that guy park the Alphard outside the house with a backdoor key so that he can use the toilet whenever he needs to ease himself !? I think that is a great idea man. More expensive than an average house. I’m curious how much is the running costs and security is like? Unfortunately far too expensive for most, it costs as much as a real house. For people who can’t afford RM600+k for a caravan, they can probably fly to Australia/NZ if and when they fancy to get a feel for it. finally no need travel to US or europe,but the price i can get a class c at us with lot more space and slide out. 150hp, good luck trying to tow it around. Maybe The Accountant will buy. Looks more like a Food Truck… For that price you might as well just buy a bus and install everything inside hence a proper living RV…. This is classed as MPV and only need D license? JPJ should rethink about it. It handles/drive differently than normal passenger vehicles. Since caravan parks are now becoming a thing, what are the rules and regulation with homebuilt trailer houses? From the price I can says its a bit pricy. Maybe due to import chassis. If made at Malaysian coach builder’s company, for this almost the same specs, maybe will get half of the price. But need to be carefull of the weight if needed to include gen-set. Ehhhhhhh….NO. Latest E class is half of that price and still need to empty the toilet myself. kthanksbye. The design of the bed does not look into the possibility of claustrophobia effect. A lot of people have claustrophobia issue. The model will not be selling well if the engineers does not look into improving the bed structure to reduce claustrophobia. Will this suit the so-called 1st world Singapore?. What’s wrong having an RV in 3rd or 2nd worlds?. Afraid of being breached?. Our country is way too small for things like this. We dont have vast empty land for you to park & stay. Caravans are suppose to be poor man’s house. Cheaper to rent houses here than to use this kind of vehicle. yea i would love one of these its make long journeys as comfortable as can be. but at that price? i wonder who thier target , are those rich people who can buy these are “adventerous” kind who utilize these kinda vehicles? funny no one is complaining of a sport car which only can fit 2 people yet price more than 1mil. come on guys. motorhomes for the vacation and experience with friends and family. not for living and neither for daily drive. Forget the price: Malaysia is just too hot and humid for caravans. These are popular in the uk and new zealand for the obvious reasons. the 313 is priced a 50K Pound which equates to approx 300K, and lands on our shore double the price.. hhmmm the tax+markup is 100% then. Nice move lol. say 1 week caravan trip in Aus. Where is their showroom / HQ? Would like take a look at the RV. This is soooooooo expensive, I believe you can get this for around GBP 47k in the UK. For that price they are offering one can buy a Winnebago Class C caravan between USD 70k-100k depending on the type of vehicle hulling your motor home. Taxes, taxes and all the con job involved. Harga adalah untuk orang kaya. Motor home dibuat untuk org berpendapatan rendah Dan homeless. Bodoh punya harga. if I order today can get before this raya? want to balik kampong. Road trip tourism is still not part of our culture. I see a lot of potential especially from Mersing to Kota Bharu. Then drive up Jeli-Grik, crossing Titiwangsa ranges. So many places of interest. The prize tag are much to expensive. My double storey terrace house cost, half this price. For introduction why such prize…people really looking forward for this, an off grid car be reasonable…………………. Benimar Mileo 313 price in UK at only £49,211 (RM 274,116). For the price i can buy a land, build a big house & buy a car . For that price i can buy a land, build a big house, buy furniture & i can buy ford truck 3.0 then make it like this . Mahal sebab tax. Naik2 harga dia. Org kaya boleh la. Kalau org2 miskin xyah beli. Hahahaha. Kuang ajooo siapa jual benda ni. Can our rugged roads like in the case of sarawak roads (not highway like west msia)safe for caravan to travel.looks good to me staying for long hours in school might be a gd mobile home in the afternoon fir relexing napping n short resting. Cantik dan menarik…. Kemudahan untuk cuti2 Malaysia…. Jalan2 (cari makan) jauh…. Ada duit boleh beli….